A healthy Fear of hospitals - could it be a longevity measure? I have a healthy fear of hospitals because other than a 2-year stint of numerous hospitalizations for small procedures to do with miscarriages, I've not been on the frequent flyer program for medical use and yet, disconcertingly, I’ve personally experienced MULTIPLE medical errors in hospital and I've gone in for a simple surgery and contracted Hepatitis in hospital that kept me in bed for 7 weeks. And when I asked my paternal grandfather what his longevity secret was (he was 101 when he died), his answer was that he avoided doctors and hospitals. He went to hospital once in the Second World war when he got shot and once about 3 years before he died for an infection. Well let's face it, if the cost of your hospital bills doesn't kill you (especially with the price gouging that goes on) medical errors just might. The prevalence of medical errors scares me and it should scare you too. In 1999 the Institute of Medicine brought out a report called: To Err is Human estimating that up to 98 000 patients were dying from preventable medical errors. Then in 2013 the Patient Journal of Safety pointed out that those figures were more like 440 000 people. And since then I've seen a report by a group of doctors who estimated it was probably double that figure. 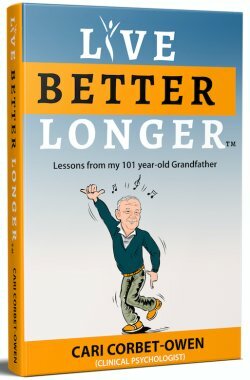 As I interview people who are living a longevity lifestyle, I'm often struck by their reluctance to go to doctors and their minimalistic use of medical services throughout their life. As I interview 93-year old Ruth, she tells me how she seldom ever went to doctors growing up and for most of her adult years and how now, she still avoids it unless it's absolutely necessary. She tells me about her sister who went for surgery and has been in and out of hospitals ever since that. Seems like a healthy fear of hospitals might be one of the secrets to longevity. When I interview 100-year old Erwin, he tells me that right up until he was 80 he never went to doctors, nor did he go for check-ups. But inevitably once he was persuaded into a doctors office he's now on a 'health regime' which included monitoring his blood pressure a couple of times a day. When I asked him how his blood pressure is doing, he says it's perfect which made me wonder why he's having to monitor it. But that's our medicalized way of life. I know one thing for sure, I'm not a fan of Big Pharma or swallowing pills, nor am I a fan of hospitals. I want to do everything I can to stay out of our disease-care system. If you do too then you want a natural health and longevity program.